Life in a lumber camp was no stack o’ flapjacks, although much of it revolved around the cook and his crew, which included a helper called a cookie and a chore boy known as the bull cook. The camp woke at 5 a.m.; breakfast came an hour later. The jacks had twelve minutes to eat, and the cooks allowed no talking (most likely to thwart criticism that could escalate into mutiny; if the crew was dissatisfied with the chow, their recourse was to stop work in protest, an action called “walking the cook”). They then went straight to work until 11:30 a.m., when the bull cook brought them flaggins, hot lunches packed in large cans. At noon they were back to work and toiled until the sun set. After a leisurely twenty-minute dinner, the loggers occupied themselves by relaxing on long pew-like seats called deacon’s benches, repairing clothes and equipment or playing a few hands of cards. Lights went out at 9 p.m. Besides the jacks and the cooking crew, the camp was populated by the camp’s clerk, called an inkslinger. Most camps were small; a camp of forty to fifty men was considered large. On Sundays the men were allowed to bathe and boil up their clothes (washing them by placing them in boiling water), write letters home, and pack their beds with fresh straw. On days off they would travel to Duluth to spend their money. 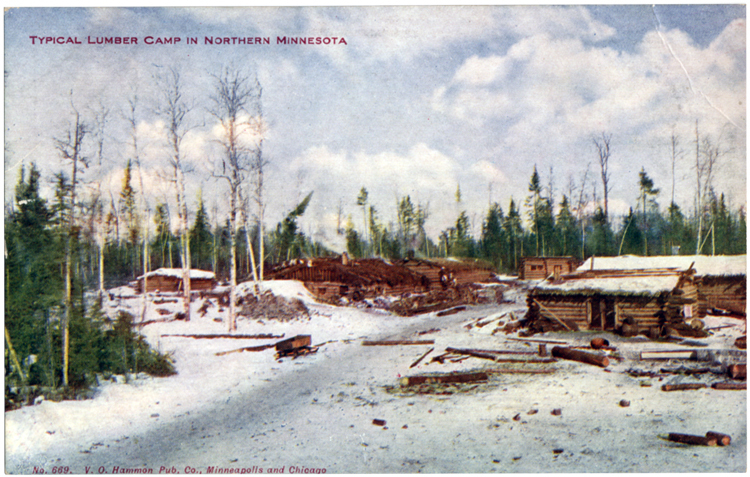 The Schroeder Company actually built two saloons and a brothel in order to keep men in camp on their days off — too often a trip to Duluth was extended by a stay in the local jail, and missing jacks slowed production. When a camp needed workers, they relied on recruiters to fill the roles; these men were known as man-catchers. Logging was dangerous work; with men slinging axes, saws, and cants — as well as trees falling and logs rolling — injuries were commonplace (a broken arm or limb was called a cracked stem). Consequently, many loggers ended up in the hospitals of Duluth and Superior. Sister Amata of Duluth’s St. Mary’s Hospital realized that lumbermen were rarely flush with money, so she sold those who worked the lumber camps a precursor to health insurance called “lumberjack hospital tickets” for seventy cents a month. The cards guaranteed the jacks medical care and a bed. It was one of the first plans of its kind in the nation. Nuns who worked for Superior’s St. Francis Hospital sold a similar plan to both lumbermen and dock workers for an annual “donation” of five or ten dollars.